*이 행사는 온라인 강의입니다. 강의에 참여하기 위해서는 인터넷에 접속하셔야 합니다. CIDA의 첫 형제자매 모임으로, 장애를 가진 사람의 비장애 형제자매 (고교생 이상 성인) 들의 만남입니다. 두번째 모임은 1월 5일 이후 발표됩니다. 참가자들은 발달장애국 셀프디렉션 예산 계정에 관해 함께 리뷰합니다. 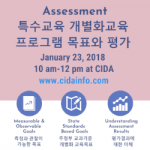 *등록은 https://goo.gl/forms/IsHma88UGNA0PazP2 또는 전화 718-224-8197. 이외 학교 및 서비스 문제점에 관한 질문받고 가족들간의 네트워크 만드는 시간을 갖습니다. 12월 27일 목요일, 12:00 p.m. – 3:00 p.m.
CIDA 가 올해로 4번째인 송년 파티에 장애 어린이와 청소년, 그 부모님들을 초대합니다! 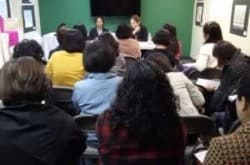 장기자랑, 노래방 대회등 아이들뿐아니라 부모님들도 함께 즐기는 시간을 마련했습니다. 많이 오셔서 맛있는 점심과 함께 신나는 댄스파티로 2019년을 맞이하세요! 선물도 준비되어 있습니다. 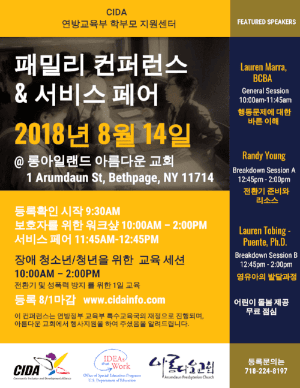 CIDA will hold a parent conference in collaboration with Beautiful Church (Arumdaun Church) on Long Island, August 14th. Training sessions start at 9:30 am. Fifteen agencies will be invited to the vendor session to present various community-based services, programs and classes available to the locale. 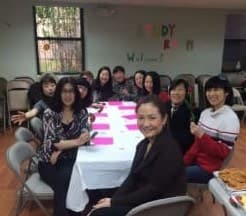 Arumdaun Presbyterian Church is located at 1 Arumdaun St, Bethpage, NY 11714. 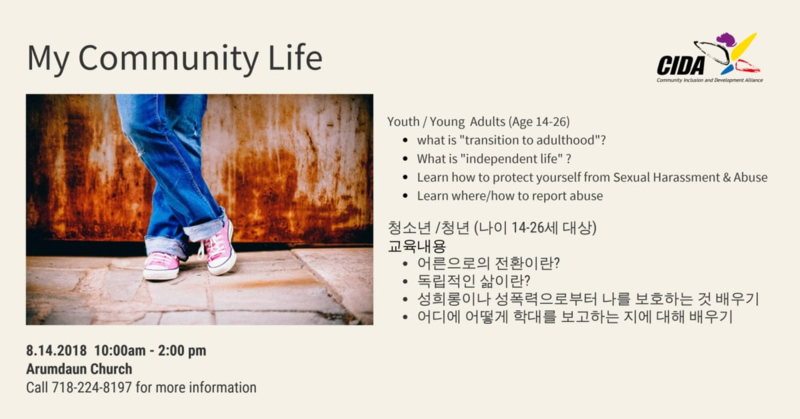 During the Family Conference on August 14 at Arumdaun Church, we will have a presentation titled “My Community Life.” This one and a half hour session will teach youths and young adults (age 14-26) with disabilities the concepts of transition and independent life. 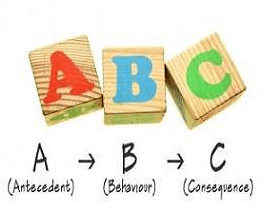 A special focus will also be given to sexual abuse prevention and decision making. A consent form should be completed before the session. 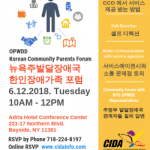 CIDA will help parents to prepare the documents that are required for OPWDD services. Please call 718-224-8197. 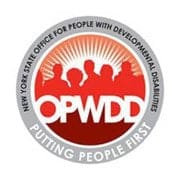 NYS OPWDD is transitioning its services to a new structure, the Care Coordination Organization (CCO). 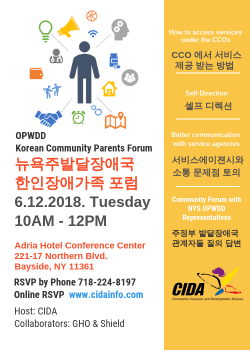 CIDA has invited OPWDD (the central office in Albany) for a forum to inform parents about how to access services through the CCO and Self-Direction. The OPWDD Central Office staff will present the various changes in OPWDD and answer questions regarding Self-Direction, describe how to access services through CCO and discuss other issues in services coordination. Meet and talk with other parents/family members that are raising children with disabilities. 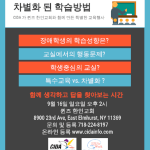 The meeting will be facilitated in Korean. 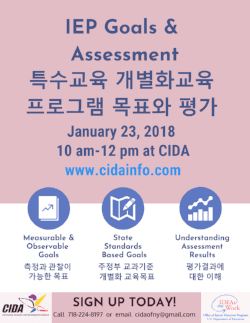 Dr. Sangwon Un from the Eden II Program will present the Functional Behavioral Assessment and behavioral interventions for children and young adults with autism. 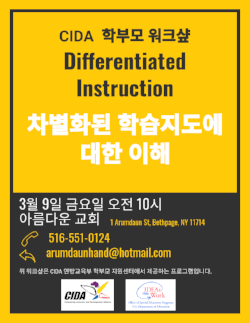 Dr. Un is a board-certified psychologist and BCBA-D.
CIDA invites OPWDD Front Door team for an English- Korean session. 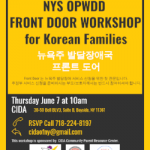 In order to apply for OPWDD services, you must attend a Front Door Session. Please register if you plan to apply for the OPWDD Programs. 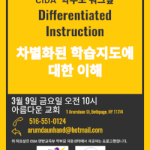 CIDA presents the overview of differentiated instruction for students with exceptional needs, universal design of learning (UDL) and importance of aligning grade appropriate state learning standards with instruction for students with disabilities. For RSVP, please contact Agape Program at Arumdaun Church at 516-551-0124 or email arumdaunhand@hotmail.com. 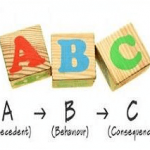 This workshop will discuss how to read and understand the standardized assessment results on your child’s IEP, developing observable and measurable IEP goals and the importance of aligning the State Standards and IEP goals. We highly recommend this workshop to those parents who participated in the Federal Laws and IEP workshop (12/5/2017) last year. 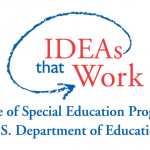 This is an opportunity to deepen your knowledge about developing IEP goals for your child. 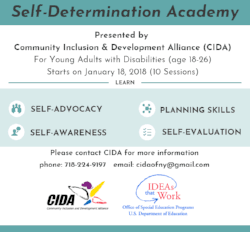 CIDA’s Self-Determination Academy for Youth and Young Adults with disabilities (under the age of 26) will begin January 18. 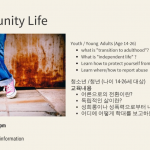 This 10 session program will teach youth and young adults teaches skills of self-awareness, making choices, IEP/ISP meeting, checking progress and time-management skills. 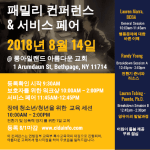 For more information, please contact Dr. Bae, Executive Director at 718-224-8197. 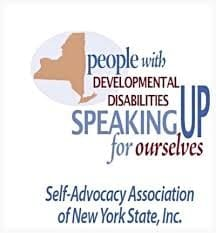 The procedures of Early Intervention (EI), the services in New York State, and Individualize Family Service Plan (IFSP) will be presented. Speaker: Mi-Young Choi, Program Director, All About Development. 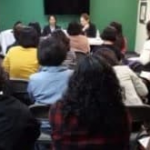 Mi Young Choi has more than 15years of experiences in EI. 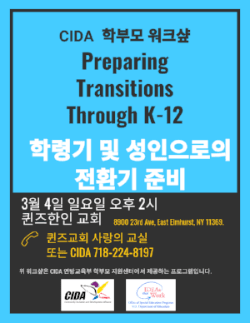 For more information, call 718-224-8197 or email cidaofny@gmail.com. Come and celebrate the New Year with us on December 28. 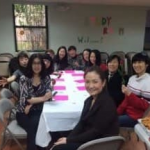 The Reception House is located at 167-17 Northern Boulevard, Flushing, 11358. Hip-Pop dance by the special guests, music performance by two CIDA families. Lots of fun and music! 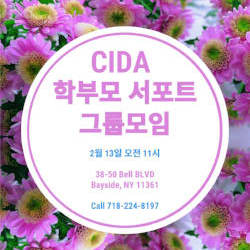 Please RSVP by December 23 to 718-224-8197 or cidaofny@gmail.com. 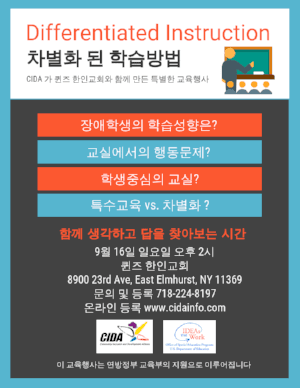 CIDA invites Minkwon Center to learn their expertise on the current immigration issues and what to prepare when you apply for citizenship for individuals with disabilities (for those who have green card). Seat is very limited.Call 718-224-8197 for RSVP. 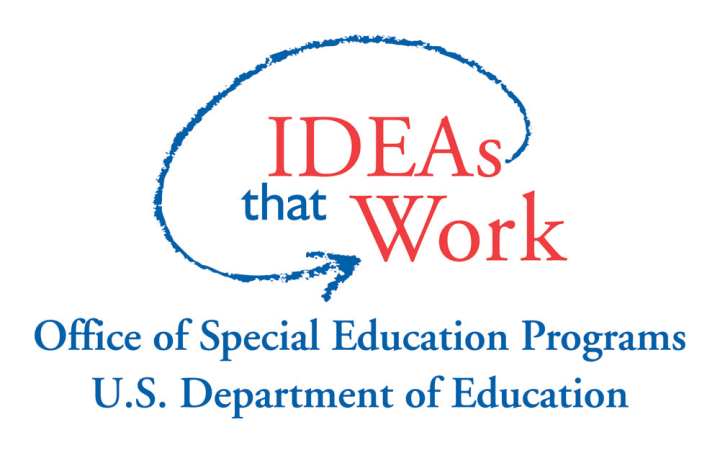 Learn the basics of ESSA, IDEA and State Laws regarding special education. The important comments of IEP will be reviewed. 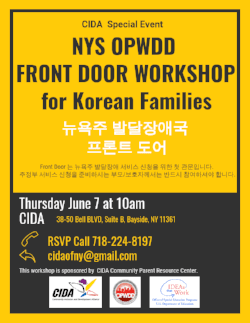 RSVP by email cidaofny@gmail.com or call us at 718-224-8197. By finding other parents who are facing, or have faced, the same issues, many parents feel better able to navigate a path they never envisioned. 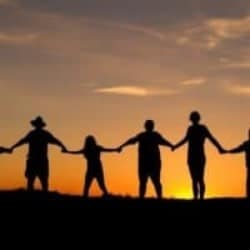 Come and join us to come a part of our strong community. 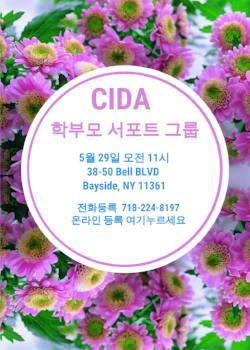 RSVP by email cidaofny@gmail.com or call us at 718-224-8197. 2017 Toward Opportunities and Inclusion Workshop Series (October 17-19, 2017) was a great success! Family participants learned useful information and resources for transition and community inclusion. 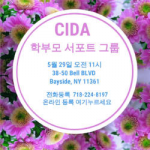 CIDA is currently providing one-on-one assistants for individuals to apply for various services and find resources that were disseminated during the workshop. Please call us at 718-224-8197 to make an appointment. 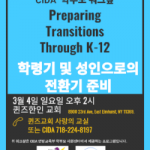 CIDA will provide a workshop focusing on transition to adulthood on October 17-18. The workshop will explain SSI, guardianship, supported employment programs and housing that are available in New York State. 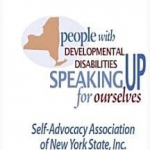 This event is sponsored by New York State Developmental disability Planning Council. Call 718-224-8197 for more information. 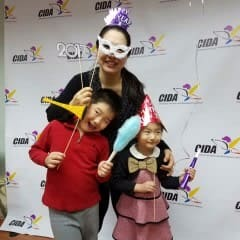 CIDA’s annual Very Special Art Festival was held at the St. John’s University on September 23. More than 100 people participated in the event as contestants, parents and volunteers. Check out our 2017 Very Special Art Festival. CIDA will serve as a CPRC funded by the U.S.DOE staring Oct 1, 2017. 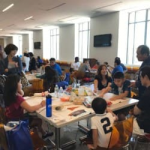 The project focuses on support and training for Korean-American parents who have children with disabilities. CPRCs answer families’ questions with practical advice or refer families to other organizations in the families’ community that can help. A program calendar and more announcements are on their way. SANYS and CIDA will co-present the Community Self-Advocacy Training Program which will take place at CIDA starting September, 2017.